I first heard of Audrey Assad like two and half weeks ago, and her music has basically been keeping me sane ever since. Some mornings I literally listen to "Sparrow" on repeat from the time I leave my apartment to the time I get to campus. If you don't have Spotify, that playlist won't work, so you can hear her on YouTube. 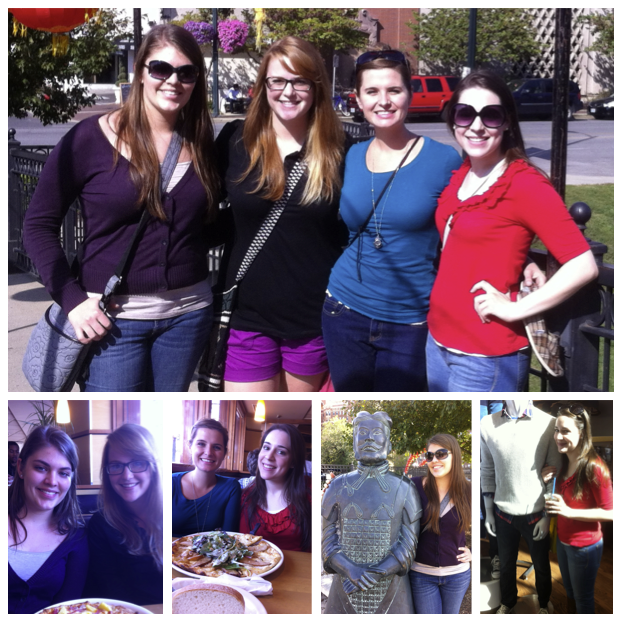 I went to Kansas City last weekend with Melissa, Hayley, and Bekah, and it was such a wonderful little brain break for me. Bekah and I met some men while we were there. By which I mean, Bekah took a picture with a statue, and I took a picture with a headless Gap mannequin. I have a stronger than reasonable appreciation for the Gap menswear mannequins. They just dress like they could hold down jobs, okay? As evidenced by the aforementioned photo of Mr. Mannequin and me (look closely), I have recently/rapidly developed an overwhelming love for iced coffee. This may or may not be the result of an overwhelming workload. I've always hated coffee, but now all of a sudden I can't get enough of it. If it is icy and creamy and sweetened, OBVS. GET IN MY LIFE, ICED COFFEE. Autumn is an inopportune time to realize that you love an iced drink. My parents came to visit me a few weeks ago, and it was just the best. My dad and I got to go to the Mizzou vs. Georgia game, and now just looking at the pictures makes me miss them so much it hurts. I can't wait to see them next month. Speaking of cute people whom I love and miss, I GET TO SEE THESE GIRLS THIS WEEKEND. Pardon me while my heart explodes. See how I was all puffy-eyed in that last pic? That was our last school day at Asbury. My heart was being ripped into a billion pieces. Saturday — for the first time since graduation — we will all be back together, and we will be celebrating sweet Katelyn's wedding. I cannot wait. I cannot wait. I cannot wait. I cannot wait. I think being at Mizzou has given me an even stronger appreciation for the time I spent at Asbury. I love Mizzou, but sometimes when I talk to undergrads, I get almost overwhelmed with sadness about the fact that they're all missing out on the small college experience that I had. Getting to go to Asbury was — and will always be, I'm sure — one of the biggest blessings I've ever been given. These girls are such a huge part of that blessing. Speaking of going to Katelyn's wedding, I am going in an AIRPLANE. I have not been on an airplane since 1999. NINETEEN NINETY-NINE, Y'ALL. That was like the olden days. The girlies and I went to an advanced showing of Pitch Perfect a couple of weeks ago, and it was hilar. I can't wait to see it again now that it is in theaters for reals. It was basically everything that Glee should have been. And now I have a crush on the main guy, which should come as a surprise to no one. I have used various forms of the word "overwhelmed" far too many times for a single blog post. Sometimes I feel the need to go back and carefully edit my blog posts and make myself sound more articulate and less like a 15-year-old girl. But sometimes I am like, "WHATEVS. I SPEND SO MUCH TIME EDITING STUFF THAT GETS GRADED THAT I AM NOT GOING TO SCRUTINIZE WHAT ISN'T GETTING GRADED." And, yes, I do think in all caps. That, too, should come as a surprise to no one.